Training Takeaways: Women Entrepreneurs Building Better Communities - The Junior League of Boston, Inc. The panel at the Women Entrepreneurs Building Better Communities panel at Junior League of Boston headquarters. 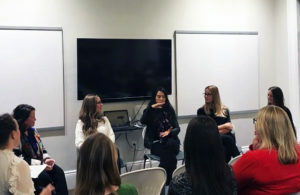 One of the latest training events offered by the Junior League was the opportunity to attend a Question & Answer session with five talented female entrepreneurs from the Boston area. Panelists were Vicky Wu Davis, Executive Director and Founder of Youth CITIES; Jessica Fracalossi, Founder and CEO of The Handle Bar Indoor Cycling Studio; Danielle Perretty, Founder and CEO of Beacon Blend; and Karen Scalia, Founder and Owner of Salem Food Tours. Each took a different path to get to where she is now, but the insight and takeaways from all the panelists shared the same key themes. 1) Don’t let your history or experience hinder you. Each of the five women on the panel came from a different background. They were accountants, actors, biologists, and executives prior to starting their companies, and none of their companies are in line with their prior experience. So when starting your own company, you don’t necessarily need to stick to what you know, but rather follow your dreams and inspirations. Find a need and fill it. Your inspiration doesn’t always come from what you’ve studied or done in the past. 2) Don’t listen to everyone’s feedback. Sure, when you are starting a company you want to gather insight and feedback from your friends, colleagues, experts in the field, and even potential investors. But while everyone is going to have some comment or suggestion, they can’t all be incorporated into your plans. When starting a new company, never lose your vision, and accept that not everyone is going to understand or share it. It doesn’t mean your venture won’t be a success; just the opposite! Those individuals just haven’t caught up with your idea yet. 3) Funding doesn’t only come from investors. In today’s world, we often think that there is only one way to get funding for a company. But these five unique entrepreneurs demonstrated that there are several different ways to get the money you need. Whether it’s self-financing, quitting your job and working as a waitress while raising money, getting one big investor or multiple small ones, there is no limit to how you reach your goal. There is no one-size-fits-all model for funding because each individual, venture, and process is different. Also, just because a company starts off with one funding source doesn’t mean it can’t change down the road. Funding should not be static. Rather, you should strategize and reevaluate over time. 4) Welcome change and obstacles. While each of the five ladies were at various stages of their entrepreneurship journey, they all still face challenges. Although challenges may make it seem like everything is falling apart, they are actually opportunities for growth and creativity. In the end, we must embrace the challenges as they happen. Overall, these women demonstrated passion for their dreams, and I personally found them inspirational. I was left with the sentiments that you should never settle or give up, you should always pursue your passions, and that each and every one of us can be an entrepreneur.